Within this site, you'll be able to access David's concert schedule, a brief biography, all the latest news and much more. 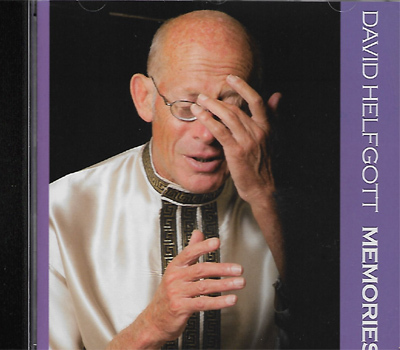 David Helfgott is truly a living legend. As early as the age of five, David demonstrated a rare gift with his piano-playing ability. Unfortunately, things took a turn for the worse around 1970 when illness overtook his life for more than a decade. Things finally started to change in the early'80s. David met Gillian and within a year made a triumphant return to the world of classical piano. In 1996, Shine, inspired by David's life made a tremendous impact on audiences and his life. David has now toured more than 37 countries to world acclaim and enchanted audiences. 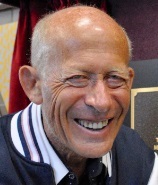 David Helfgott was born in Melbourne, Australia, in 1947. He showed extraordinary pianistic ability from an early age, winning the state finals of the ABC's Instrumental & Vocal Competition six times. 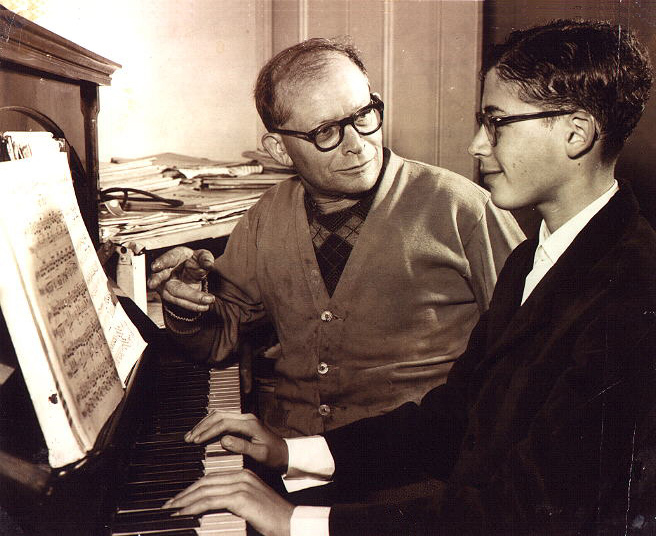 At age 17, David began studying with Alice Carrard, a former student of Bartok and Istvan Thoman, himself a pupil of Liszt. Two years later, David went to London to study at the Royal College of Music with Cyril Smith, who described him as his most brilliant student in 25 years of teaching and likened him to Horowitz, both technically and temperamentally. David won a number of awards at the College, including the Dannreuther Prize for Best Concerto Performance for his triumphant performance of Rachmaninov's Third Piano Concerto. However, towards the end of his time in London, David faced increased emotional instability and mental excitability, compounded by the death in Perth of his mentor, writer Katherine Susannah Pritchard. A period of frequent hospitalization followed during the 1970s, but by 1976 David had moved to a halfway house where he stayed for six years. The greatest crisis for David had been the loss of his inner music, but he remembers the day the music came back: "The fog lifted, I could hear again ... I survived." Dr Chris Reynolds, who owned Riccardo's wine bar in Perth, where David performed on Saturday nights, brought David back to the public's attention. It was there he meet his future wife, Gillian, who, with the support of promoter Mike Parry, helped David gradually resume his concert career with concert performances in Perth and a sell-out tour of Australia's eastern states in 1986. This was followed by a trip to Europe, with recitals in Germany and Denmark. David triumphantly returned to an active life of concert giving and performance, and made a series of CDs, including the soundtrack of the Oscar-winning film Shine, which celebrates his remarkable and inspiring life. David's recording of the Rachmaninov Third was the number one selling CD in Australia, the United States and the United Kingdom for many months. Both attained gold status. In October 1996, David played four sold-out concerts at the Sydney Opera House, an unprecedented occurrence. A challenging world tour followed the next year, with packed recitals and performances throughout the US and the UK, concluding with David's return to the Royal Albert Hall in London, were he played the Rachmaninov Third Piano Concerto to a capacity crowd and received a thunderous standing ovation. Over the next five years, David kept up his world touring, through Asia, Africa, Japan, New Zealand and Europe, while also maintaining a busy Australian schedule. David released four more CDs, including Brilliantissimo, Brave New World, and one featuring the Tchaikovsky Piano Concerto No.1 and Rachmaninov's Variations on a Theme of Paganini, two of David's favourite works. However, the highlight release for this year was In Viva, a disc containing two movements of the Mozart Piano Concerto No. 24 from David's prize-winning performance in Perth when he was fourteen years of age. In 2002, David was invited to represent Australia at the Beijing Music Festival and in Guangzhou, while 2003 saw a triumphant tour of Europe - particularly of Austria, where he completely won the hearts of the Viennese. 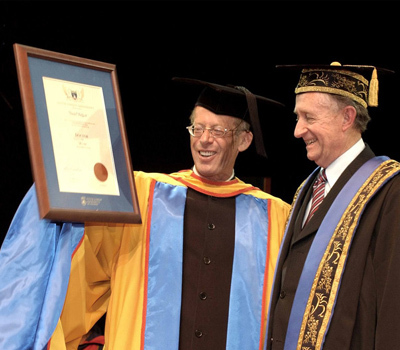 One of the major highlights of David's career came in October 2004 when the Edith Cowan University in Western Australia awarded him an Honorary Doctorate of Music. His whole family was in attendance. David conquered Europe yet again in 2005 and 2006. In Italy, he played the Rachmaninov Third in Montecatini Terme, where both Verdi and Puccini lived and where David and Gillian were awarded the Key of the City. Then it was on to sell-out performances of the concerto in Vienna and Zurich, plus many recitals in Spain, Norway and Denmark. On 26 November 2006, David was inducted into The Australian Walk of Fame. In 2007 and 2008, David had extremely successful return tours of South Africa, New Zealand and Japan, and major European tours. But his recital in Sydney in November at the City Recital Hall gained the greatest accolades heard in the Hall in recent memory. 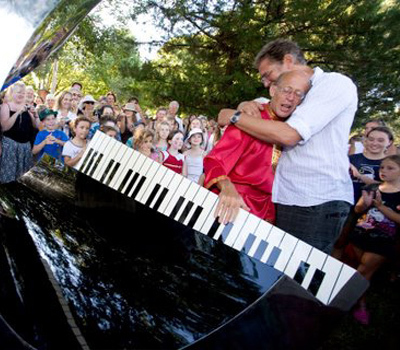 The year 2009 opened with David receiving a huge honour when a 2.7 metre sculpture by the internationally recognized sculpture, John Van Der Kolk, was dedicated to David and placed in the Bellingen Council Park in recognition of David's courage, contribution to music and his work in the community. In June, David performed in Israel for the first time in both Jerusalem and Tel Aviv as part of the Australian-Israel Cultural Exchange, and then toured Turkey and Europe, with a very successful recital in Vienna receiving one of the greatest ovations of David's career. 2010 was David's busiest year with tours of Germany, Cyprus and Turkey, some relaxation at home, then big tours of Australia before returning to South Africa and Zimbabwe. Denmark, Switzerland and Austria, followed by a performance at a conference in Kansas City, a trip to beautiful New Zealand and finally a return home in December. 2011 started in Budapest, followed by Denmark, extensive touring of Turkey and Italy, and more touring of Australia. 2012 was a very exciting year with performances of the Rachmaninov Third Piano Concerto in Europe, the highlight being the performance in the famous Musikverien Concert Hall in Vienna where David received a sixteen-minute standing ovation for a truly memorable performance. Vienna was again the highlight in May when David performed to 40,000 people at the Life Ball, supporting AIDS. The next day, 19 May, he performed in the Hofburg Palace at President Clinton's fund-raising dinner, which happened to be David's 65th birthday. After the performance, David was embraced by President Clinton and the President of Austria, who then stood and sang with all the guests "Happy Birthday". It was certainly a night to remember. 2013 saw further honours bestowed on David by the Commune of Montecatini Terme in Tuscany, which granted him Honorary Citizenship. This famous spa town is renowned for its association with Puccini and Verdi. 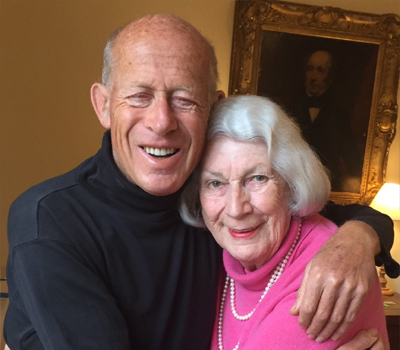 A return to Budapest in July that year was a special occasion to perform the Rachmaninov Third, as it was the birthplace of Madame Alice Carrard, one of David's most influential and beloved teachers and a fitting end to his European tour. In August, David undertook his largest Australian tour with 24 recitals. In September, gave his Farewell Tour of South Africa. 2014's touring started in Turkey, to our delight. Again there was a great reception and an invitation to return in 2015 for recitals in Istanbul, Izmir and Ankara. Austria, Denmark, Germany and Switzerland were also on the 2015 agenda, plus a return to Budapest to perform the Tchaikovsky Piano Concerto No.1, much to David's delight. However, the outstanding musical highlight of the year was David performing with Rhodri Clarke the Rachmaninov Third Piano Concerto on two pianos at the Sydney Opera House. This was followed by a truly memorable performance repeated in Melbourne in June 2015 to an ecstatic audience. 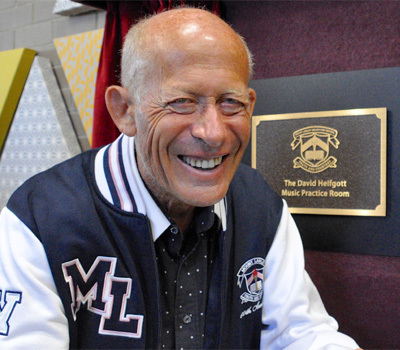 2015 also saw David returning to his old school, Mt.Lawley High School in Perth, where a piano practice room was to be named after him. This was a very nostalgic event for David and the current students were greatly inspired by him. David also performed with the Royal Australian Navy Band. This was a huge crowd pleaser and a very happy event. David is always thrilled to perform with other musicians and hopes to do a repeat performance in the near future. 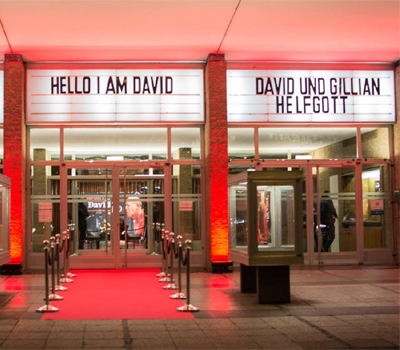 2016 was a particulary exciting year with the release of the German documentary Hello I Am David, which covers touring with David performing the Rachmaninov Third Piano Concerto. It is a very endearing film and is now available on Netflix. Touring in 2016 was very extensive, covering Germany, Austria, Denmark and Turkey, plus Australia extending the number of countries where he has performed to over thirty five. 2017 will start with tours in Europe of the stunning performances of the Rachmaninov Third Piano Concerto for duo pianos, events not to be missed, and a return to the UK (after a long gap) for performances again of the "Rach 3" in Manchester and, to David's great joy, London at The Barbican on 29 May. 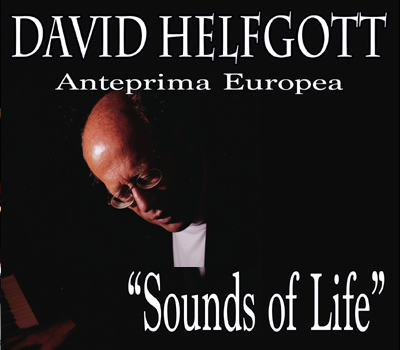 Another highlight will be David's 70th Birthday Celebration Recital in Copenhagen in the Konsevatoriets Koncertsal. 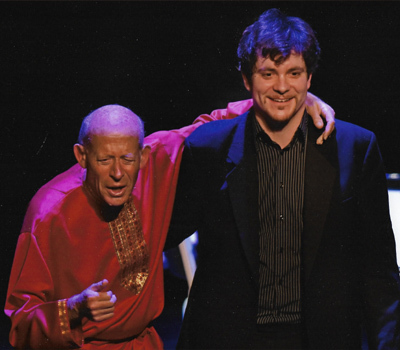 The truly extraordinary artist that is David Helfgott is continuing to receive the worldwide recognition that his remarkable technical and interpretative genius deserves. His continuing and unparalleled success comes as no surprise to David's legion of devoted admirers everywhere. They have long regarded his recitals as transcending mere music making, and an affirmation of the tenacity of the human spirit and imagination.